I thought I’d let everyone know what I’m currently reading. Some really good stuff, albeit, some pretty heady stuff as well. 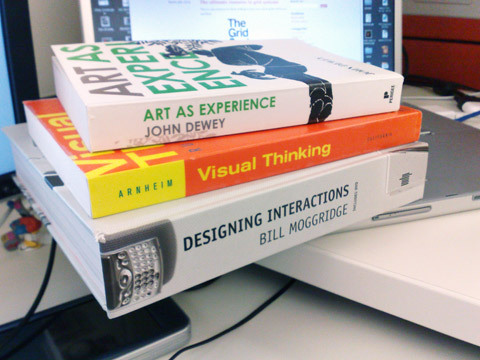 I read about Art as Experience while reading a short book about Paul Rand. In the book Rand mentioned Dewey and his aforementioned work regarding aesthetic theory. Rand goes on to mention that anyone considering themselves a designer should read this book. Furthermore, he mentions that if you can get through the first chapter, the rest will be worth the challenge. With that, I began reading and found the book to be quite engaging. Again, very heady stuff, at least for me, but very thought provoking nonetheless. The first chapter, as Rand mentions, is a challenge as Dewey attempts to set the stage regarding modern societies compartmentalization of Art into a box (the modern museum) and out of it’s rightful place in society and as an expression of the people and their culture. Anyway, I’ll leave the rest up to you. Another heady, but well worth the effort, read by one of the most notable thinkers in the area of perceptual psychology. Arnheim begins by challenging the early theories of visual perception dating back to Plato and Aristotle by arguing that the dichotomy between perception and reasoning is false and misleading. The rest, well, is history. Not the heady reads like the previous two books, Designing Interactions is a nice look at the authors involvement in the birth of a new design practice, eventually called “interaction design.” The book continues with interviews with other designers responsible for the development of the discipline. The title is a little misleading in that it’s not a book for those wishing to learn how to become interaction designers, but a book on the history of interaction design. All in all, a nice read.